Sweet potatoes, Ipomoea batatas, are propagated either from the roots or from stem cuttings. Some sweet potato vines grow erect; others spread along the ground. The sweet potato itself is a storage root used to store plant nutrients. Fibrous roots under the soil branch off from the sides of the sweet potato stem. The fibrous roots anchor the plant and absorb water and nutrients from the soil. Pencil roots branch off from the fibrous roots. Thick, fleshy storage roots also grow from the stem under the soil. These are the sweet potatoes. A storage root has a root stalk, the proximal end that joins it to the main stem of the plant. The proximal end contains most of the latent buds that will sprout under the right conditions. The other end of the sweet potato is the distal end. The middle of the potato and the distal end will also sprout, but usually later than the proximal end. Storage roots may be joined to the stem in clusters or separately. Some of the skins look like alligator skin; others contain long grooves or veins. Sweet potatoes come in numerous shapes--some are round, oval or oblong; others are elliptical or long with irregular curves. The color of cylindrical sweet potato stems varies from green to a reddish-purple. Those cultivars with erect stems grow up to 3 feet tall. Those with stems that spread out on the ground grow up to 15 feet wide. The shape and color of sweet potatoes leaves depend on the variety. There are rounded, heart-shaped, kidney-shaped, spear-shaped and lobed leaves. The leaves alternate on the stem in a spiral pattern. Leaves can be yellowish-green or green and partly purple. Some leaves are purple when they are young. The leaves also have hairs that are glandular and are usually more numerous on the bottom of the leaf. The ability of an individual variety of sweet potato to flower varies greatly. Some don’t produce flowers; others produce some flowers; still others flower profusely. The trumpet-shaped flower is bisexual; it contains a male stamen and a female pistil. Green or purple buds are joined to a short stalk. The flowers are reddish to pale purple or purple. Although sweet potatoes are ordinarily propagated by cuttings or by nodes on the tubers, they do produce fruit containing seeds. The round fruit, brown when it is mature, contains four brown to black seeds. The seeds can remain dormant for years and are very difficult to germinate; the hard seed cover usually needs to be scratched or broken, a process called scarification. 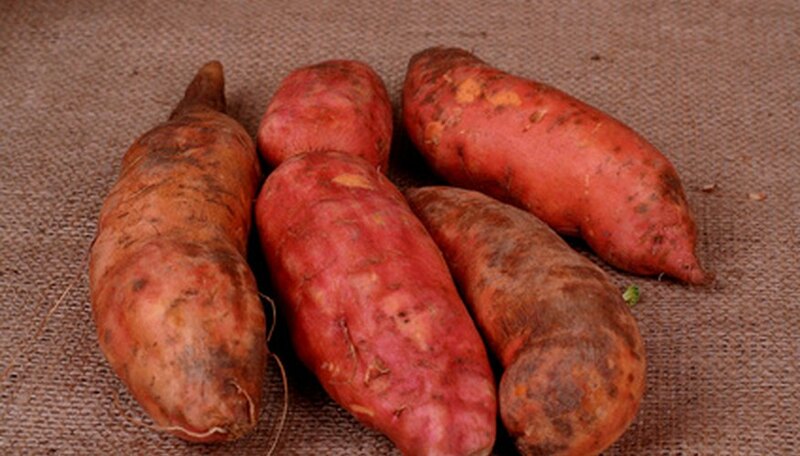 Texas A & M University: What is the difference between a sweet potato and a yam?